I can only remember one Miss America winner. She had a bold nose, played a lap harp like a rock instrument, and her family spent 3 years in South America as missionaries. That was Charlene Wells. Charlene was different, really different in a few big ways. She won without getting a nose job. It was the first time she had entered a beauty contest. She wanted to win, but didn’t obsess about it. Charlene was practically odd in those things. Job interviews are often beauty contests. If there are more than 3 people being interviewed, 2 could do the job. 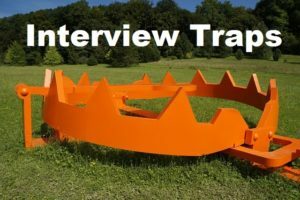 If there are 10 people being interviewed, there will be at least 5 who could fill the position. So how do you get picked? You have to be memorable in a lot of good ways. What is different about you and your background? School grades, hobbies, the network in your basement and that you wore a nice suit may make you stand out. That you sold out the High School Yearbook ads in one month by yourself or you lived in a cave in college will be even more memorable. Make sure your interviewer observes how you are different. Don’t rub their face in it, but be different. Give them a couple of personal tidbits to remember you by. Distinguish yourself from the herd. It could be that you have 5 brothers, raise rabbits, or love dogs. Yes, it may even be that you are incredibly qualified. Something about you must be memorable or you will be an also ran. Want to really stand out? Send two thank you notes to everyone you interviewed with. Send one email as soon as you get home. Send another thank you on paper. Being grateful for an interview will set you apart. Two days later when they get the paper thank you, it reminds them who you are. So you have a lot of competition? Chances are slim? Grab the opportunity by the throat and be memorable in a nice way. Make a list of things that are noticeably different about you in a good way. Be sure personal notes of interest are on the list. Get some help from your friends and family.